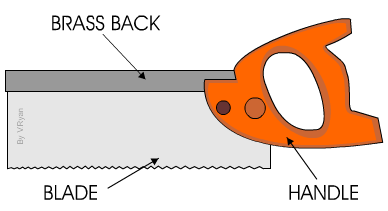 Back Saws get their name from the steel or brass back (labelled on the diagram). The heavy back gives the saw its weight which is useful when sawing wood. The weight of the saw along with the forward sawing motion allows the saw to cut through woods relatively easily. The two main types are the tenon saw and the dovetail saw. TENON SAW : for general sawing and cutting mortise and tenon joints. HOW THE SAW IS HELD? The saw has to be held in the hand carefully. The index finger must point in the direction of sawing and it also helps to support the whole saw as it moves forward. The saw must not move from side to side or it will jam in the wood making sawing difficult. 1. The wood to be cut is marked out carefully using a try square and marking knife (see try-square information sheet). Concentration is very important. The saw must always be held straight and the first few cuts with the saw must be made slowly. Once an initial groove has been cut sawing should be easier. However, slow down the cutting motion when the wood is almost sawn through - this will prevent the wood splitting as the saw finally cuts the wood into two pieces. 1. Draw a tenon saw labelling the parts. Describe how the saw is held in the hand. 2. Try sawing a piece of scrap wood using a bench hook and tenon saw as shown in the animation. There is something wrong with the way the saw is held and its position. What is it?